For those of us who are part of the climbing community here in Florida, we have definitely felt the deficit when it comes to realistic training for outdoor climbing. It’s true when they say that the only real way to prepare for an outdoor climbing trip is to simply climb in the great outdoors. However, when you live in South Florida you aren’t exactly close to any mountains. Luckily, the owners of Project Rock Climbing Gym (PRC) heard their fellow climbers cries and found a way to bring the mountains to us. The facility creates an atmosphere that allows avid climbers and those new to the sport the opportunity to experience rock realistic walls and features that top out at 60 ft in height. These simulated walls range from the southeast sandstone, to the smooth granite of Yosemite and everywhere in between. This gives an all-around tour of the American climbing scene that can be completed in one afternoon. These rock realistic walls are also mixed with more traditional gym walls to give a well-rounded training and climbing gym. As if the incredible climbing wasn’t enough, PRC also brings an unparalleled sense of community with monthly events. One of these unique events is the monthly full moon night climbing event. 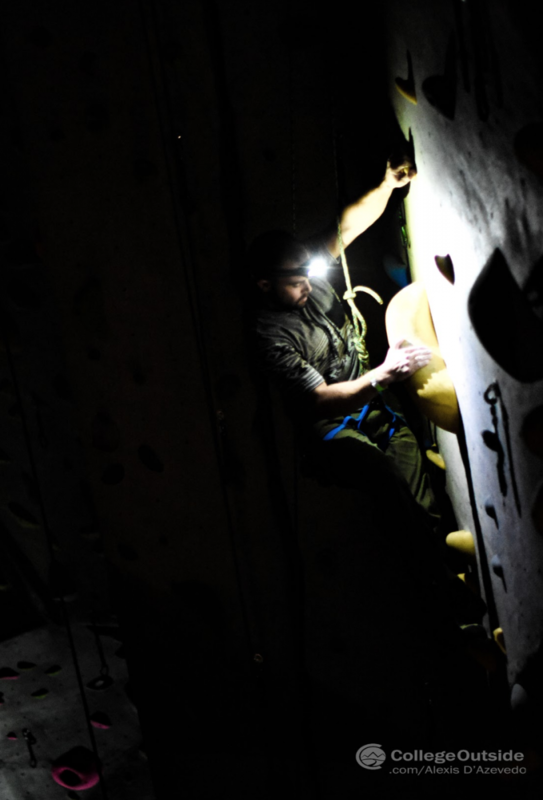 Climbers wear headlamps and brave the walls in the completely blacked out gym. For those that have never had to climb with only a headlamp on, this experience is one that can’t be surpassed. This night climbing event is also a great way for climbers to learn and practice in a safer environment than on the side of a mountain. I have personally never had the experience of climbing in the dark before this, and I feel more confident in my abilities to safely handle myself now that I have become aware of the techniques required. From a photographer’s perspective, headlamp climbing also yields some truly magical photographs. PRC is an immense asset to the local college climbing community here at Florida Atlantic University (FAU). With the gym being located only 15 miles from campus and reduced rates for students, the FAU climbing club has really taken advantage of the top-notch routes and unique features of the walls. With the opening of Project Rock, they have brought more attention to the sport of Rock Climbing in a truly underserved community and has allowed for the sport to grow and evolve here in Florida in ways that would not have been possible without them. And now that it’s summer, check out crash pads to get bouldering outside!